Stong And Compact In Design; Having Excellent Balance And Rollability. * Recommended For Small Shops And Garages Having Hard Surface Floors. *Equipped With Cylinder Hold Chain And Hose Supports. 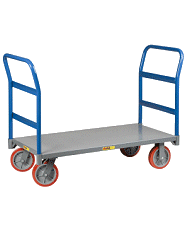 *Concealed Angle Legs Prevent Load From Resting On Wheels When Truck Is Stationary. *Handles Small To Medium Cylinders.